SustainableWork: Iowa County, WI. Entrepreneurship options help create 28 new jobs. Bob's 'Bad Word' BBQ. New restaurant brings buzz to downtown Dodgeville. Good food = Good economic development. Iowa County, WI. Entrepreneurship options help create 28 new jobs. Bob's 'Bad Word' BBQ. New restaurant brings buzz to downtown Dodgeville. Good food = Good economic development. 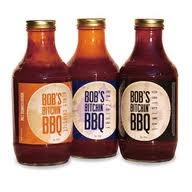 Bob Page is the entrepreneur behind this great food story - Bob's Bitchin' BBQ. Annette Pierce (Food Service Director at the Wisconsin Innovation Kitchen, and Mistress of the Universe) and I helped bring Bob's amazing BBQ sauces to market. The WI Innovation Kitchen (WINK) was able to prepare Bob's recipes in smaller, affordable batches under certified commercial kitchen standards. Bob started with his Original flavor first. When he expanded online and through farmer's markets he added new flavors. It was really fun to help all this develop. I'm proud that I drove and unloaded the delivery truck when needed. So... next thing you know Bob leaves his job and opens a very cool new BBQ restaurant in downtown Dodgeville. Right across the street from our historic courthouse. Our focus on entrepreneurship helped bring this very cool food entrepreneur and his wonderful products to market. We helped Bob grow from concept to execution to growth. The results include good local jobs and a new vibrancy in downtown Dodgeville. I often bring out of town entrepreneurs to Bob's Bitchin' BBQ for lunch. Nice way to tell our regional economic development story and eat like BBQ royalty all at once. “Iowa County Area Economic Development has been key to helping me start my new business in Iowa County. This support has led to my being able to open a new restaurant in downtown Dodgeville, now employing 28 people. Iowa County Area EDC site. Our rotating news feed includes more stories like Bob's Bitchin' BBQ.